Big Sis, Lil Bro and I have been doing a lot of cooking over the summer. Both Banker and I love cooking and food. So, it is no surprise that we would want to share this with the kids. Banker likes his meat and fire, and has recently developed a craziness about bread. I like my cakes and puds. This division of labour is not a matter of happy circumstance, but a compromise between two bossy cooks who have now become highly territorial over their area of expertise. Lest Banker ever attempt another foray into the tarte tatin area, there will be full out war (his was way under-caramelised anyway). My own love of food came straight from my mother, a talented cook of Chinese cuisine; she would taste something at a restaurant and then set about trying to replicate it at home from the memory of the flavours. Sadly this meant that we had no cook books whatsoever at home; my mother cooked fabulously on intuition. The smells of Taiwanese beef noodle soups, sesame broiled chicken and New Year cakes deep fried in batter always filled our home. 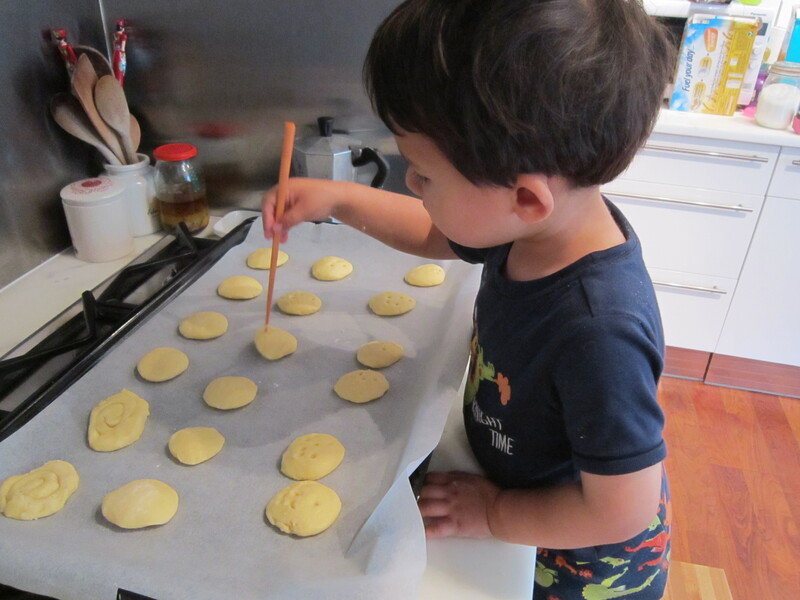 I watched her cooking from a young age, and dumpling making was a family affair. Sadly though, I lack her flair and am woe-fully recipe bound in my own practice. In contrast to my mother’s still total vacuum of recipe books, my household has over-flowing shelves of them and they are always attempting to colonise tables and floors. I can remember from early childhood pouring over cook books from the local library. Although I was brought up on my mother’s excellent Chinese cuisine, it was Western puds that I craved: warm sticky-toffee pudding with ice-cream, brandy-laced chocolate mousse, apple-pie with vanilla flecked custard. The Chinese lack the key ingredients of cream and chocolate for desserts. Although I will be the first to stand up for red bean as a chocolate alternative, I cannot quite find a cream substitute and perhaps my love of dessert making arose from my cream-deprived childhood salivating over pictures of chocolate éclairs. It is from this background that cooking with the kids has become a staple weekend/ holiday activity. 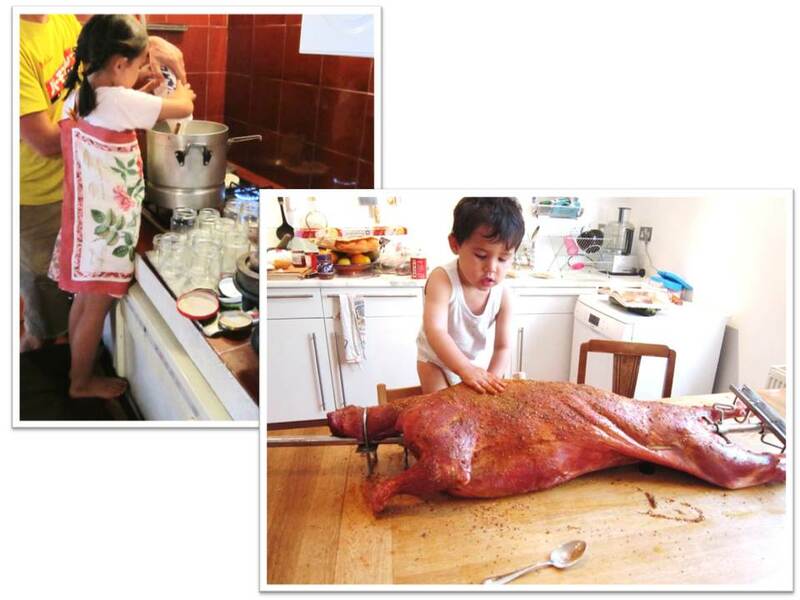 It is great fun to cook with kids given the hands on mess-making that can be had; wonders of science and alchemy involved, satisfaction of making something from nothing and best of all the gobbling up at the end. If you are still sceptical, cooking involves mathematics (measuring and weighing, calculation if doubling or halving recipe ingredients to make more or less), chemistry (melting, dissolving, colloids, acids, boiling points and much more, especially if you attempt to make honeycomb), biology (nutrition, health), history (spices and the spice trade, origins of recipes), geography (where ingredients come from, food miles, farming practices), art (decorating cakes and plating up) and P.E. (try whipping a meringue by hand, and have you seen the size of a baker’s arms?). I cannot think of a more enjoyable and educational activity for children. What other activity can awaken all 5 senses as well as stir the imagination? Yet why aren’t all parents doing this with their kids? It was a sorry state of affairs to see on Jamie Oliver’s TV program that British primary school children could not identify common vegetables such as a courgette and an aubergine. More depressing when you see excellent home cooks whipping up gorgeous food, but not having time to cook with their children, or for fear of the mess. Why don’t they pass on their passion? I know that in my generation of women, there are some that deliberately avoided learning to cook. “Home Economics” as it was then called at school, was a subject reserved for the non-academic; a “wood-work” equivalent for the girls on track to early motherhood and a life of domesticity. High-flying women feared that their ability to cook would mean enslavement to the kitchen; but personally, I think they were cutting off their noses to spite their face. Not only is cooking a highly enjoyable creative outlet, but an essential life skill, and given the rise in obesity levels, knowledge about food, healthy eating and cooking may save your and your children’s lives, and everyone should be taught to cook. A friend of mine has a lovely little business teaching little ones about food if you need inspiration. Of course nowadays, food has had a reinvention and young men and women have become passionate about food and there has been a renaissance of fine eating in London. The depressing thing though is that I don’t think that it has filtered down to children. Although Jamie Oliver has done a sterling job in highlighting the atrocities of school dinners, what about the stuff we are serving to kids at home? I have found that many parents, even foodies (myself included at times), cook separate meals for their children (invariably pasta or chicken based); then sit down for their own dinner of something much more interesting. Children’s menus at restaurants dare not stray from spag bol and chicken nuggets; and yet how are children to learn of new flavours and textures? Worse still, the London restaurants serving the most interesting food discourage children, either by snooty staff/ clientele with intolerance for children, or sky high prices. Not so in other countries. In the Far East, eating is a family affair and for Dim Sum in Hong Kong, you’d be hard pressed to find a table for two. Dining is without exception en famille, with everyone sharing the same interesting food on a massive table laid to the brim served by a lazy Susan. Closer to home, on a recent trip to France, Big Sis and Lil Bro tried veal’s head truffle, cuttle fish balls and petit pois ice cream for dinner from a 12 Euro Menu d’enfant at a 1 star Michelin Restaurant. That’s roughly the price of a Pizza Express pizza and ice cream. Why can’t we get this in London? Contrary to popular belief, children can develop an interesting palate with exposure and encouragement, Lil Bro totally enjoyed guzzling down snails in France, and although Big Sis is less adventurous, she has developed a taste for a variety of interesting cheeses. I hope that the new found British enthusiasm for all things foodie can find its way to our children. 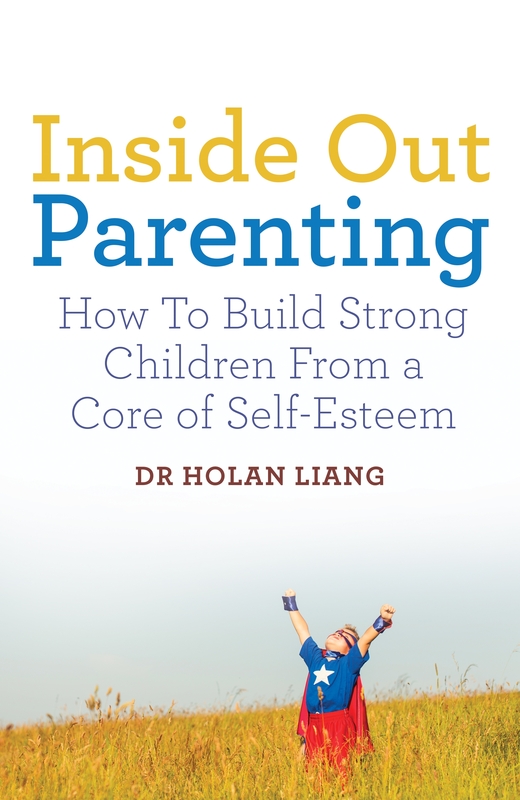 Now that schools have done their part; isn’t it time parents and restaurants did the same? 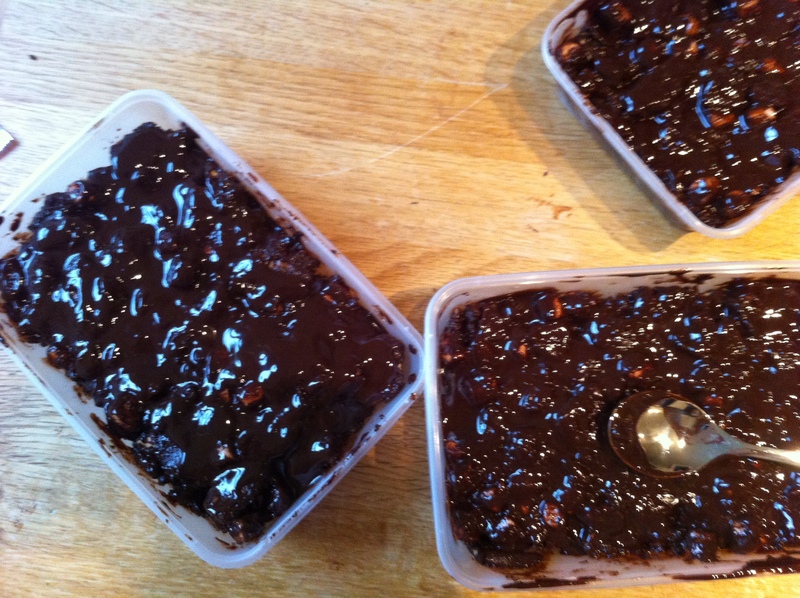 For those wanting a quick and easy starter recipe that’s great for kids, here’s Big Sis’s step by step guide to our version of Nigella’s Rocky Road. 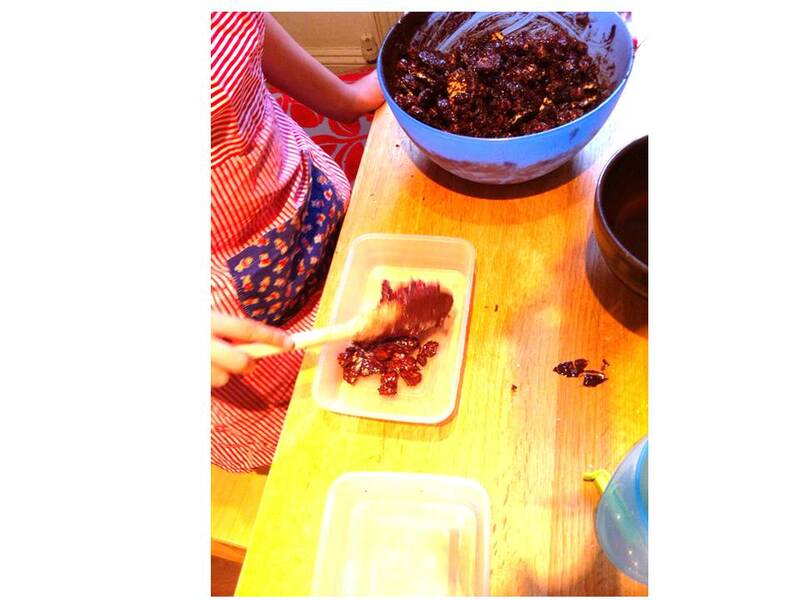 So easy Big Sis can make it herself (almost), pretty much mess free and devilishly scrumptious. 1. Break up 300g of chocolate. 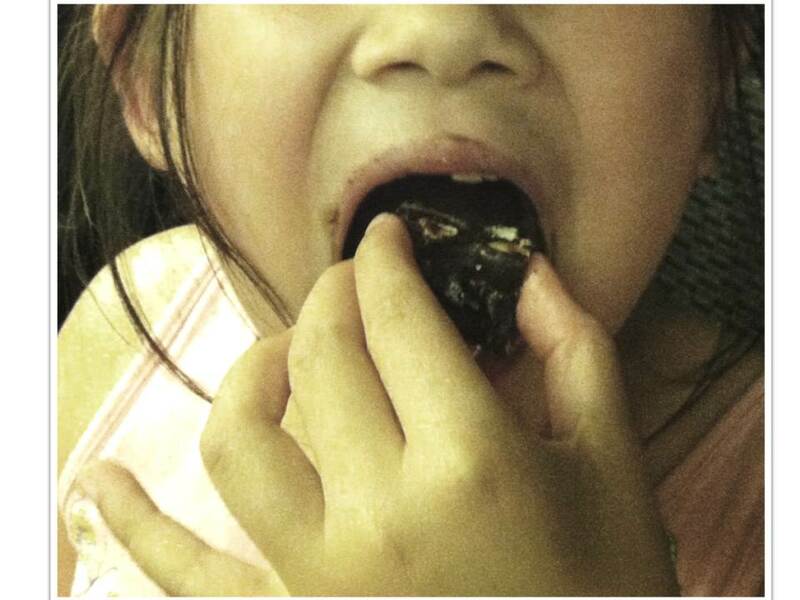 We use dark chocolate (>70% cocoa solids) as it is less sweet, better quality and also as Lil Bro had a dairy allergy and now prefers dark chocolate. 2. Put into a bowl with 125g of butter. 3. 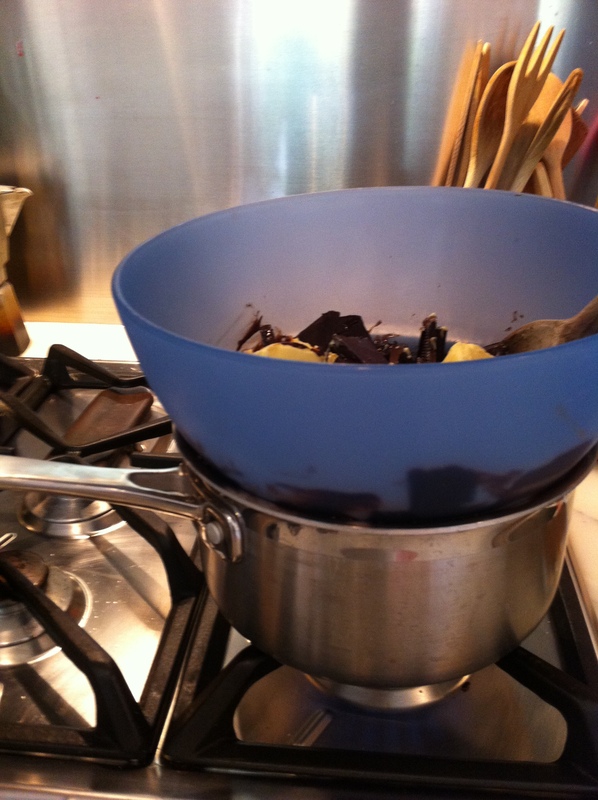 Melt the chocolate and butter together in the bowl over a pot of boiling water. (I’ve tried this part before in the microwave and it doesn’t work very well). If your butter was at room temperature, then you can actually get it to all melt together over a pot of boiling water from the kettle if you use a metal bowl, thus avoiding any requirement for an open flame for younger kids. 4. 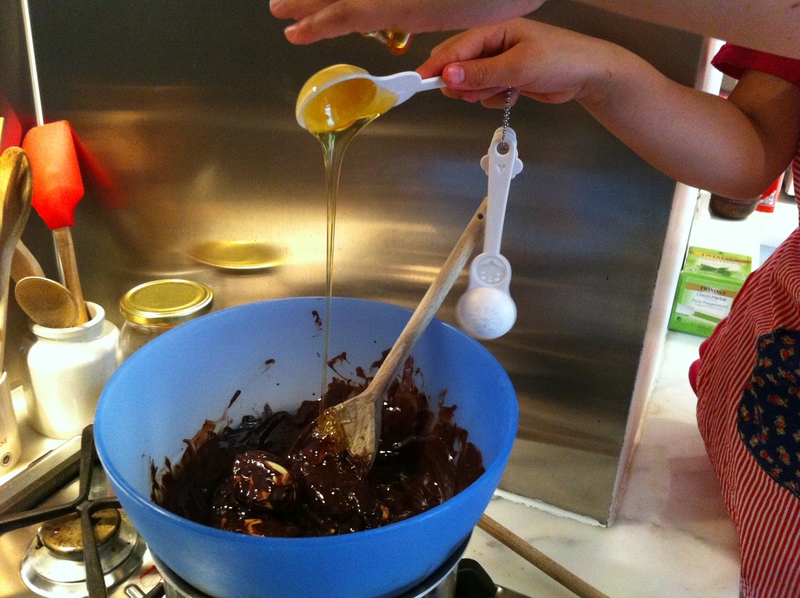 Add 3 tablespoons of golden syrup to the chocolate and butter, or, we have also used honey and that also works well. 5. 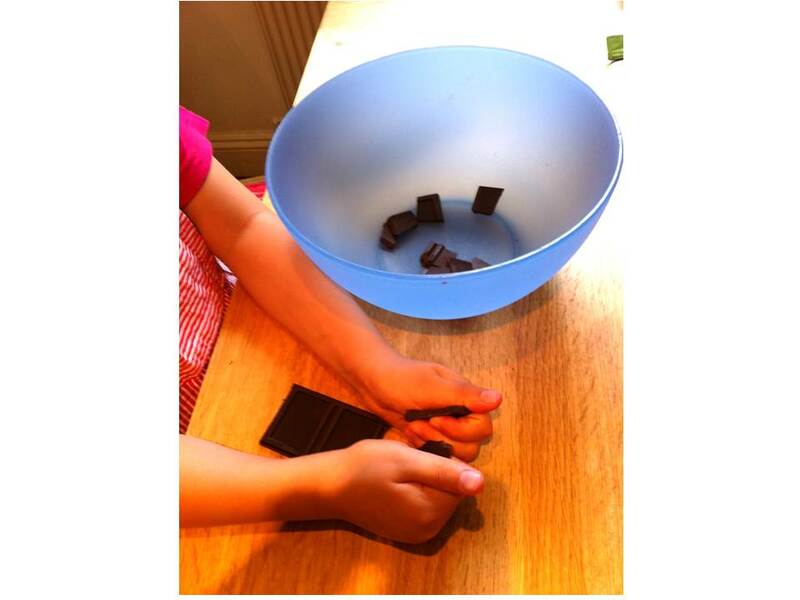 Put 200g of biscuits in a plastic bag and bash it with a rolling pin. Kids love this. A mixture of crumbs and big bits is perfect. Nigella uses Rich Tea biscuits in her recipe, but we prefer digestives. 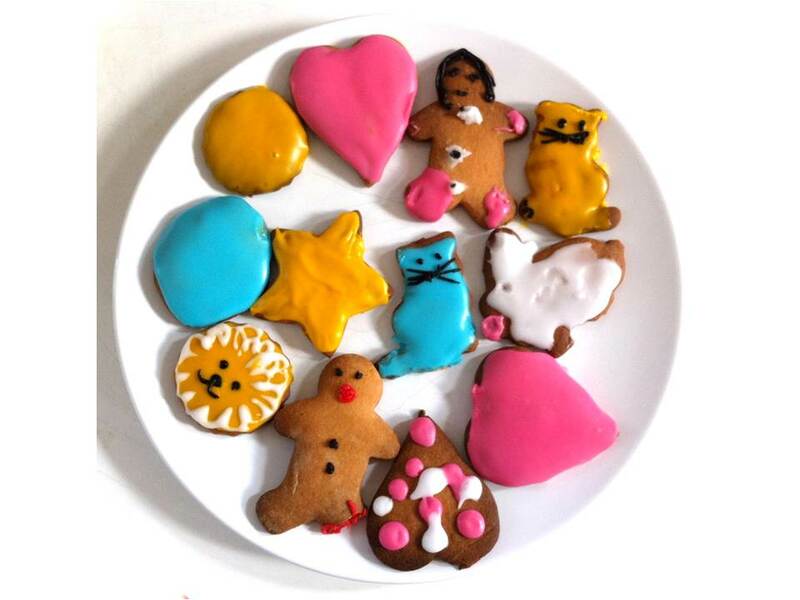 You can also do ginger nuts or amaretti biscuits for a posher version. 6. 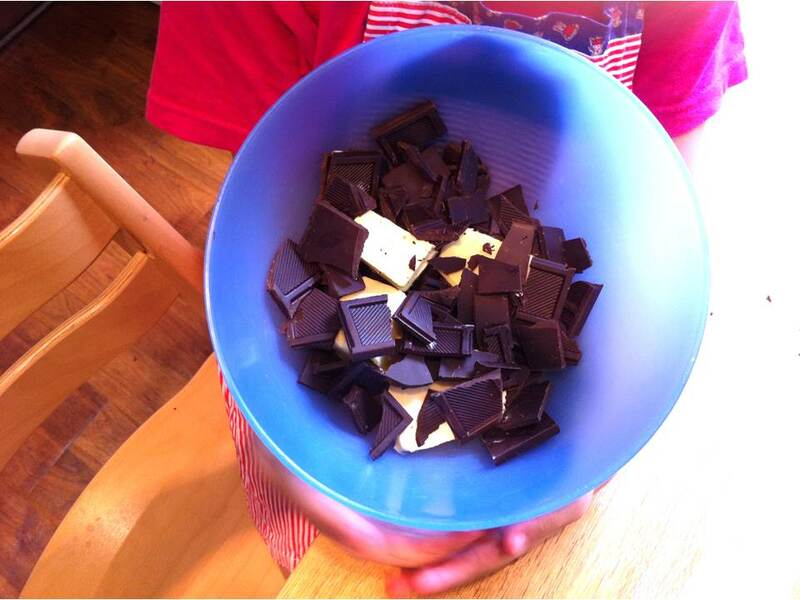 Pour half the chocolate mixture into another bowl and put to one side. 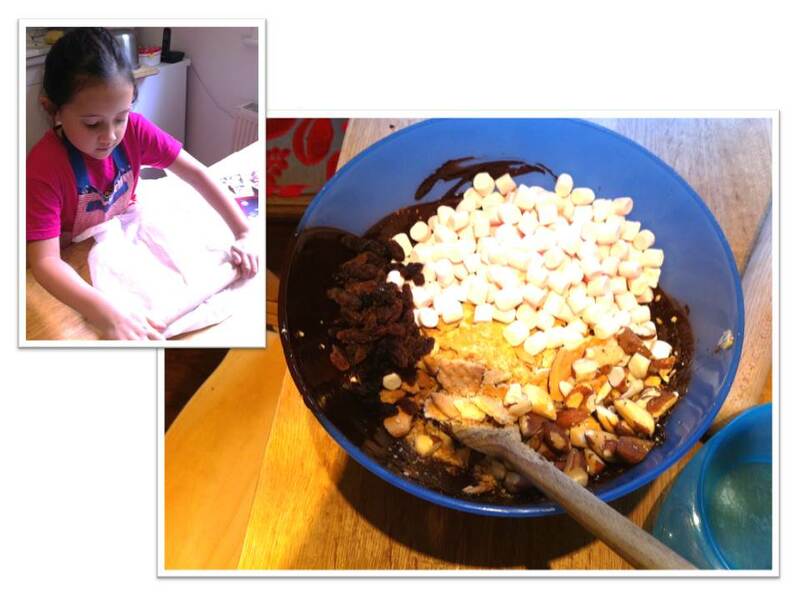 Pour the biscuit bits into the remaining chocolate mixture and add 100g of marshmallows. Or, what we do is to add 70g of marshmallows then throw in 30g or so of other stuff, e.g. raisins, cranberries, brazil nuts, pistachios, almonds, orange zest, Turkish delight, smarties, fudge bits, salted cashews, white chocolate chips, desiccated coconut, coffee essence, vanilla essence – whatever takes you and your kids’ fancy. 7. Mix up the goodies with the chocolate. 8. Spread the mixture into a container. A foil container that you can easily bend open is best, but we never have them in the house when we need them. We have plenty of plastic boxes from takeaways and they work just as well. They also have lids so you can stack your boxes up in the fridge to save space as well as carry the rocky roads with you for picnics easily. 9. 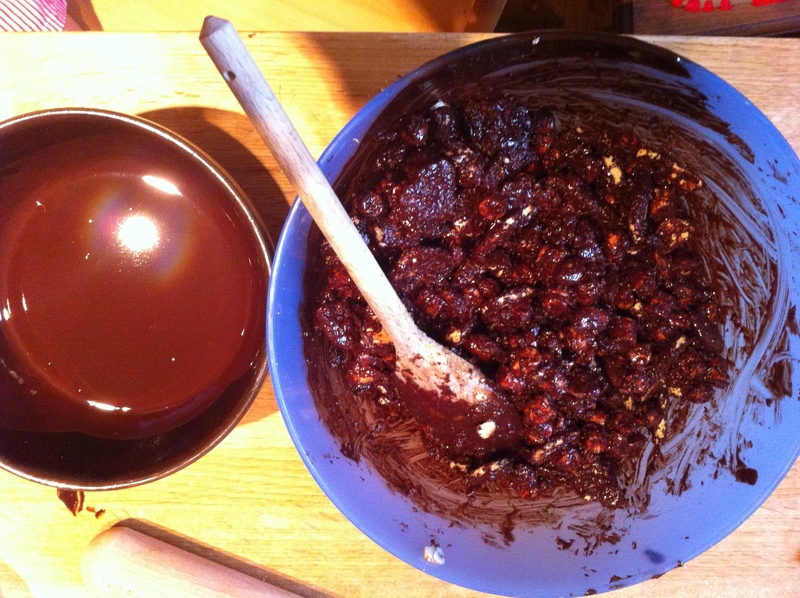 Squash the mixture down with a spoon as much as possible, then pour over the remaining chocolate. Put it in the fridge to set. 10. Once set, cut into squares and sprinkle with icing sugar, or just gobble it up as is!